Women who sail and liveaboard may all be different but from my own experience and talking to, going aboard their yachts and reading about others that go cruising …we still love some of our home comforts. Yes we are living in a confined space on a sailboat and we know we must get down to the basics that are important to us. Of course this is not ignoring the important things about the cruising life like a safe and well equipped boat, that includes the safety equipment, one that sails well and is dry where it counts … on the inside! 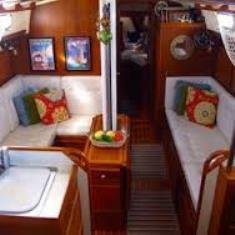 Ruth from Canada on the yacht Witchcraft commented, “Living aboard in below-zero places requires some thought and planning, but we have the comforts of home and a TV, laptop and telephone.” And of course winter in Canada heating is all important. What are our most important areas on a yacht, no matter what the size! It’s important to have a cabin with a comfortable bed, which means a thick mattress and bulkheads so you are not going to be thrown out when the boat heals over. Good cosy bedding with plenty of pillows. Not stuffy and a way of keeping cool if sailing the tropics a fan at the very least. Privacy if others are on board. Remember when underway especially if shorthanded you can get very sleep deprived, so make this a special haven, a retreat to renew your energy. No bright lights …dimmed and if you have a stereo in the cabin some restful music. The main salons a place not just for yourselves but for entertaining guests at times and so comfortable places to sit with cushions to ‘curl’ up with … I feel are important. Build a bit of personality with some special photos, books and souvenirs from different voyages. 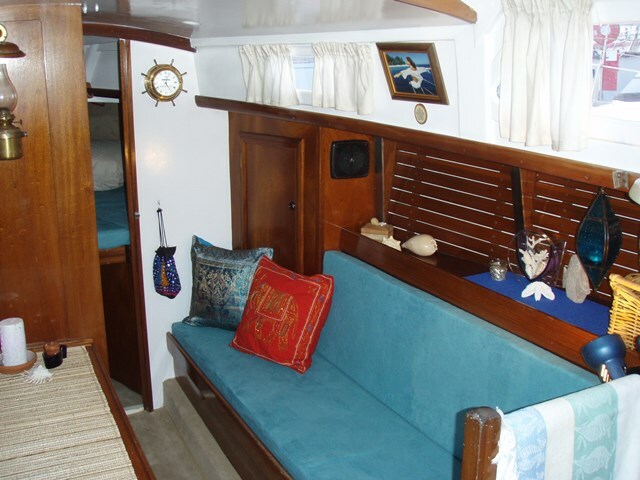 This is most likely the area for reading, eating, watching TV or DVD’s when not on deck. There should be an area to get out of any wet weather gear so as to keep this area dry. I know a friend that used to get really upset when her partner would come into the main cabin straight from diving or fishing instead of showering and drying off on the deck. I’m with her… naturally… treat it like a lounge room at home! The Galley! A good gas cooker and refrigeration makes life comfortable. Everything must be very easy to reach an arm’s length away is good, and you must be able to brace yourself in an area when underway. Places to hold on to ... a grab rail for safety and cruising comfort. An adequate area of bench space and an empty sink to put a boiling pot or cup of coffee in to prevent it going all over the floor or worse you… with a sudden lurch of the boat. 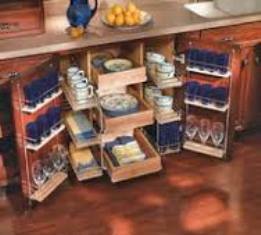 Make it easy in the galley with equipment like pressure cookers and plenty of plastic containers, designated storage space for sometimes weeks of provisions; know where everything is so there's no searching in rough seas. Heads! Oh yes in the form of a bathroom ….this is where I would like the lot! With plenty of water! 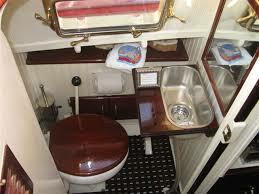 But that does not happen in most small yachts; mine only had a toilet and wash basin with a reasonable size cupboard. A shower you had to improvise with an outdoor solar shower. But people that used my heads always said it definitely was in a female’s boat…. It didn’t smell of rotten eggs, quite the opposite, it was clean and all the necessities where there with nice hand towels and nautical décor. A comfy cockpit became very important to me especially when I reached Australia with its very hot summers and downpours in the wet season. Like Jill (above) said it’s nice and much cooler to sleep outside in the tropics. So a good Bimini that covers most the cockpit and gives adequate shade is important for cruising comfort. And some cockpits have just narrow benches and can be very uncomfortable. 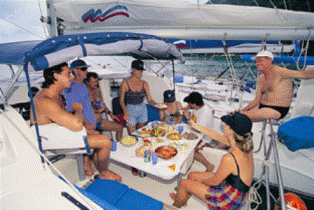 So some good cushioning, places to put drinks or even eat without spillage or getting in the way of equipment as this is the place most sundowners with good sailing company take place. 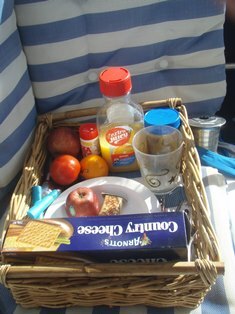 When solo sailing I have a basket of snacks and drinks in the cockpit so I’m not spending all my time below when it may not be safe… navigating in different situations. OK …. 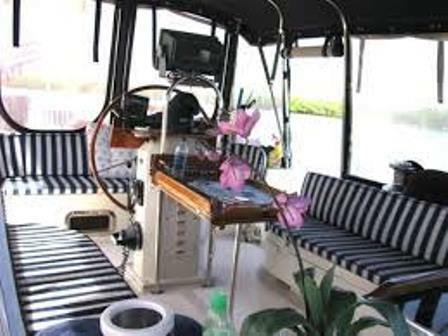 So I have been on some men’s yachts where they are very fussy even having flowers on the salon table when in marina’s…. 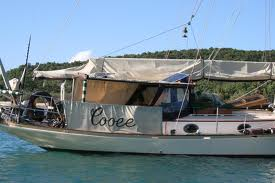 and their boats are very clean, comfortable and well kept. But I have been on some yachts belonging to male sailors that are can I say … revolting! Gear everywhere, dirty, with dishes not done and beds unmade; boat bits and grease scattered throughout the living areas. There would be no cruising comfort here! But for the most… ladies who sail and liveaboard we like a bit of cruising comfort just like what they may have left behind on shore. And it really does come back to the way you lived on shore …. We all have our standards!